Herbs, perennial, rhizomatous. 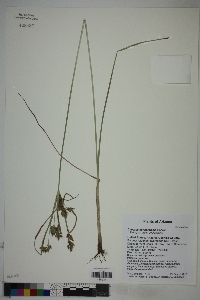 Culms basally cormlike, trigonous, (8-)15-40(-60) cm × (0.4-)0.8-1.5(-2) mm, glabrous or sparsely to densely scabridulous to minutely scabrid on angles or usually on surface, just proximal to bracts or over distal few centimeters. Leaves (1-)3-4, V-shaped, (7-)15-25(-40) cm × 1-3(-5) mm, sparsely minutely scabridulous on margins and keel in distal 1/3, otherwise glabrous. 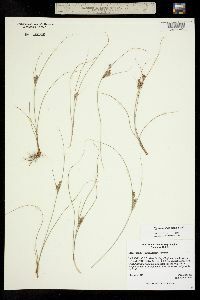 Inflorescences: spikes 1-3, sessile (occasionally 1 spike on peduncle 5-20 cm, produced from axil of distalmost leaf), loosely cylindric to oblong-ovoid, (9-)15-30(-45) × (3-)8-15(-18) mm; bracts 2-3(-7), longest erect, or very nearly so, others spreading, (1-)3-20(-26) cm × (0.5-)1-3(-5) mm; rays (1-)2-6(-11), (1-)2-7(-12) cm, in some depauperate plants rays less than 1 cm; rachilla ± deciduous, wingless. 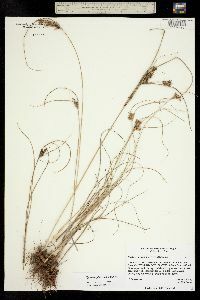 Spikelets (4-)8-25(-35), oblong-ellipsoid to linear, compressed-quadrangular, (2-)7-11(-15) × (2-)2.4-3.2(-3.5) mm; floral scales (1-)4-8(-14), laterally dull whitish, stramineous, or light brown, or reddish brown to deep red, often red-dotted especially near keel, medially greenish, broadly ovate-deltate to ± orbiculate, laterally strongly 3(-4)-ribbed, medially weakly 1-3-ribbed, (1.6-)1.8-2.4 × (1.8-)2.2-2.8 mm, margins clear, erose especially apically, apex obtuse, tipped with straight mucro 0.1-0.2(-0.3) mm. Flowers: anthers 0.4-0.6 mm; styles 0.4(-0.8) mm; stigmas 0.6-1 mm. Achenes finely reticulate with isodiametric cells, this layer gradually wearing away to reveal inner brown to reddish brown layer, stipitate, ovoid to obovoid, 1.4-1.6(-1.9) × 1-1.3(-1.4) mm, base cuneate to ± attenuate, stipe 0.1-0.2 × 0.2 mm, apex obtuse, slightly apiculate, inner layer papillose. Fruiting summer. Clearings in montane forests; 1000-2500 m; Ariz., N.Mex., Tex. ; Mexico. 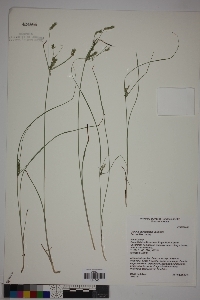 Cyperus sphaerolepis has long been known by the synonym C. rusbyi and has been treated as a variety of C. fendlerianus. 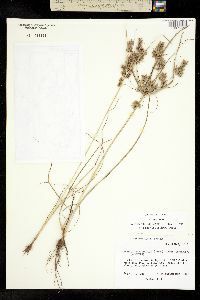 Specific status for C. sphaerolepis is supported by B. G. Marcks (1972) and G. C. Tucker (1994).